Wolves, like people, communicate in many ways. They use their voice, face, posture, hair, and tail as well as their senses of smell, touch, vision, and taste. Skilled communicators, wolves choose what they need to get their message across: during the day, for example, they may communicate with posture, but at night howling or other vocal signals may work better. Howling, the most well known type of wolf communication, is an attention grabber. According to Fred Harrington and Cheryl Asa in"Wolves: Behavior, Ecology, and Conservation," howling can "instantly reach an audience from near to far at any time day or night." But much of the vocal communication between wolves is quieter, like the subtle sounds from pups in a dark den. Pups are deaf at birth, start to hear by day 14, and by day 20 reach their adult hearing level. During those two deaf weeks, they moan, whine, squeal, and scream, but these sounds decrease as pups grow. By three to four weeks of age - when emerging from the den with adult level hearing - pups can make all the sounds of an adult and howl with the pack. But another six weeks must pass before a pup sounds like an adult. Adult sounds, according to one researcher, can be divided into two categories: harmonic and noisy. Harmonic sounds such as whimpers, whines, and yelps are used when acting friendly and submissive, Noisy sounds such as growls, snarls, woofs, and barks are made when being aggressive or dominant. Other researchers found that when wolves are close together, howling sounds discordant, but when separated by at least ten yards, their howling is harmonious. 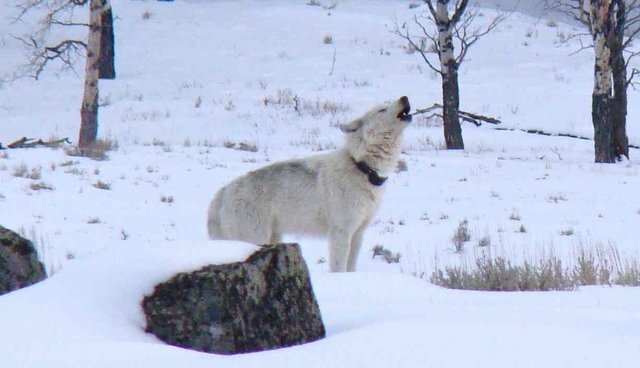 Howling is long-distance communication. Wolves can hear another wolf howl up to six miles away in a forest and up to ten miles away on tundra. But howling is not long-lasting communication like scent marking. Harrington and Asa write that an average howl from a single wolf lasts only three to seven seconds. A chorus by a pack can last 30 to 120 seconds, and longer during breeding season. Short or long, howling works. It helps wolves find pack mates and can be part of a reunion. Unfamiliar howls reveal strangers. Lone wolves howl for a mate. Though many people believe that wolves howling together must be a bonding experience, Harrington and Asa say that there is no empirical evidence to support this. They also say that you can't determine the size of a pack from its chorus howl, and "In times of uncertainty, wolves may use a 'poker' howl that limits the amount of information that might be available to unintended ears." Howling even varies with the seasons. Doug Smith, head of Yellowstone's Wolf Project, told a reporter for Living on Earth that during denning season, wolves stop howling to their neighbors and howl only to pack mates. But as summer progresses, wolves howl more and more to neighbors and enemies. This territorial howling peaks in February during the breeding season. In upcoming posts two and three, I will write about other ways that wolves communicate. To listen to a variety of howls, check out the Living with Wolves website.